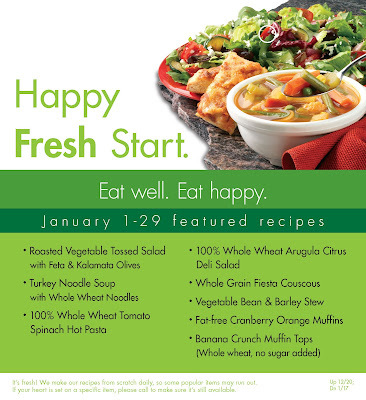 At the Fence: Start the New Year Off Right at Sweet Tomatoes! Happy New Year! How many of you resolved to eat better this year? Well, Sweet Tomatoes or Souplantation is the place to start. Now, I personally have never visited a Souplantation, but we go to Sweet Tomatoes whenever we visit an area that has one. My older children really enjoy eating there. Sweet Tomatoes has to have one of the LARGEST and FRESHEST salad bars I have ever seen. And the best part? It is organic! When you enter the door you are greeted by a really long salad bar where you can fill your plate with some of the best salad items ever! They have a few pre-made salads for you to choose from and the rest is build your own. When I say pre-made, I mean they mix up a few ingredients there, not some pre-packaged salad. Fresh ingredients made right there that day! The salad bar starts with several different kinds of lettuce and greens. Then you can choose from a variety of veggies to add to your salad. As you reach the end, you can add cheese and your choice of salad dressings. That is not all though. After you decide on a beverage, pay for your meal and find a seat, you can then visit the other food bars. Here they have baked potatoes, focaccia, Soups, chili and desserts. For beverages you can choose from water, soda, tea or juices. You can also mix them up if you like! Below is their January Featured Recipes. These are on top of everything else offered. Oh, and I forgot to mention the breads! I personally enjoy their Blueberry Muffins! My husband thinks their chili and focaccia are really good. Strawberry Lemonade is another family favorite. What a great way to start your year off. Deciding to eat better! Be sure to visit Sweet Tomatoes or Souplantation if you never have before, I highly recommend them! One neighbor will receive 4 (one time use) dinner passes (this does not include your beverage), so they can try out a Sweet Tomatoes. Enter this one and be sure to let others know! Disclosure:I received no monetary compensation for this review. All quotes in red are taken from the sponsor's email or website. All thoughts and opinions are mine. I like salsa on French bread slices with melted cheese! I love this place -I wish there was one in my town. My New Year's resolution is to walk at least 10,000 steps each day! I plan to declutter my basement this year. It's time to purge lots of junk. to do a kind deed each day. One of mine was to get our finances in order.